UPDATE (4 p.m. Friday, July 13) — A city buildings employee says that the demolition of 241 Carroll Street, seemingly, brick by brick, will continue through July. Who’s paying for it? We ask. “The city will send someone the bill,” he says. What’ll go in that lot? “The owner is building a new building there,” he says. UPDATE (1 p.m. Tuesday, July 3) — It appears that the city will demolish the 50-foot-wide grand brownstone next to P.S. 58 Elementary School on Carroll Street slowly, and carefully, in order to not compromise the attached home next door, and surrounding structures, after 241 Carroll Street collapsed around 1:30 a.m. on Monday. Working crews were setting out lumber on Monday evening in preparation for the demo work. Tuesday, a massive crane was erected and then taken down, replaced by workers in a cherry picker basket knocking away at the side of the building with hand tools. TV crews surround the block and will probably continue to cover the story throughout the day and night. It was a busy scene next to Carroll Park on Monday morning as FDNY, police, city employees and neighbors surveyed the frightening scene—a gaping hole across the entire side of the brownstone left children’s rooms and furniture open to the warm morning air. 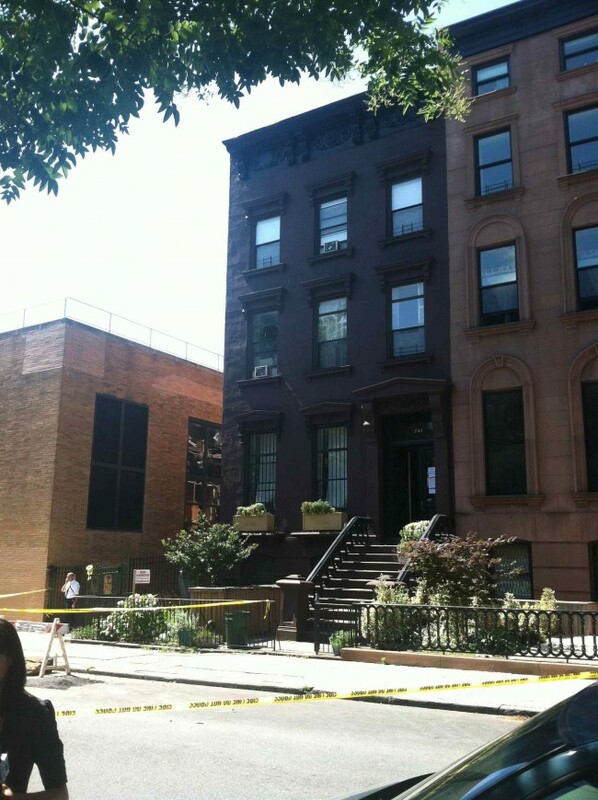 According to the New York Post, a French family was home on the top floor of the brownstone when it started to fall apart. Miraculously, nobody was injured, and the owners and their children were on vacation. If they had been home, the collapse could have been a true tragedy, and the home really fell apart on the parlor floor. Neighbors living in houses on 1st Place, behind 241 Carroll, were evacuated in the middle of the night, after waking up to loud crashing sounds. “It sounded like someone was dumping a large amount of metal into dumpsters in the alley next to the school,” said one resident, the dad of a 10-year-old and 7-year-old. He said it was frightening. “My wife is in a hotel right now, waiting to hear what the next step is,” the man said Monday at around 10 a.m. The man said the noise woke him. He went to his terrace and watched the building fall into the alleyway between the brownstone and the school. Shortly afterward, the FDNY came knocking and evacuated the nearby homes. The two homes next to 241 Carroll are also evacuated until after the demolition. The cause of the frightening collapse is unknown. The city says age and natural deterioration are to blame, as the home dates to the mid 1800s. And in the mid 1900s, the adjoining building was demolished to make way for PS 58, which also could have destabilized the structure.